Like other successful teachers, Katie McKay understands the necessity of connecting students’ lives to what they are learning and the importance of generating “positive identity,” two bedrocks of successful learning as she sees it. 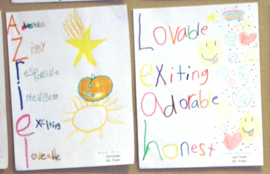 Examples of “positive identity” Wordles by students in Katie McKay’s class. Those two simple guiding thoughts led to writing exercises that culminated in a community-building event which ended up significantly changing McKay’s school. In fact, McKay’s work was profiled in Planning to Change the World: A Plan Book for Social Justice Teachers 2010-2011, a book designed to help teachers translate their vision of a just education into concrete classroom activities. Students then added their own positive self-descriptions and those of their classmates to produce “Wordles.” A Wordle allows users to create a graphic “word cloud” from text. The cloud can take on different shapes. The more frequently a word appears in a given text, the larger the word appears. For example, Jackie’s Wordle emphasized such traits as her creativity and responsibility. McKay understood right away that the Wordles could help build the self-confidence students would need to succeed socially and academically. She also invited parents to come after school to the computer lab where their children taught them how to create Wordles, some of which were bilingual. A Wordle by a father named Guibaldo describes him as “generoso,” “amable,” “estricto,” and “dedicado,” among other things. Throughout the process McKay kept front and center her role as a bilingual teacher. The Wordle exercise grew into other innovative ways to use multimedia in the classroom. In 2008, against the background of the presidential election, McKay’s class conducted an in-depth study of discrimination in the post-slavery years and during the civil rights movement. At the culmination of this unit students worked in small groups to produce two iMovies by narrating a slide show of cartoons that they had drawn. One of these movies depicted scenarios reminiscent of those portrayed in picture books about the civil rights movement. The second movie described a possible scenario of discrimination among youth today, such as being left out of a game because of lack of language proficiency or being teased for wearing old clothes. For the students’ work to have true power, though, they needed to have a real-world audience. McKay arranged with the Café Caffeine, a local coffee shop three blocks from her school, to feature her students reading their work and presenting their Wordles. She worked to get all of Becker Elementary School involved in these readings—and tied the event to the National Day on Writing, October 20. One performance at the café drew over 80 people, including several people without children in the school who had recently moved into the neighborhood. “It was really exciting for the students to feel like their stories were heard and appreciated,” says McKay. Other community events followed. There was, for instance, a performance by Becker students of Beatle songs at a local outdoor restaurant. With new families moving into the neighborhood, McKay and a few of her colleagues started a group they called the Becker Advocacy Committee to get community input about the school. One idea that came out of those meetings was the desire for a two-way English-Spanish immersion program. The group successfully lobbied for this program, which will be introduced at Becker this fall. These and other efforts by McKay to reach beyond the school walls have led her to accept a new position in the upcoming school year as the school’s parent support specialist. She will be a community/parent liaison with goals of directing parents in need to social services, working with the PTA, forming relationships with local businesses and mentors, organizing events to promote parental involvement, and increasing student attendance rates. “I know that with the new population that we are attracting with the dual language program, we will need to be mindful of organizing events to bring old and new families of diverse cultural and linguistic backgrounds together,” she says. In recent years, McKay’s efforts as a teacher and teacher-leader have been recognized. She’s received National Board Certification, been named an exemplary teacher by her Wake Forrest alma mater, and been a semifinalist for the elementary Teacher of the Year award in Austin.